The Empire Hotel & Country Club is located along the coast and has moderate ups and downs. The course makes fantastic use of the natural terrain through the use of its tropical rainforest.Although the front 9 is not so difficult, the routine is very nice as each hole has been designed in a way that makes the course flows smoothly. The back 9 offers placers a fascinating experience with an interesting and rich layout. Every hole at back 9 is characteristic. Since there are only a limited number of blind holes, players will be able to properly plan their play. The course is quite long as it exceeds over 7000 yards with a total of par 71. It can also offer a unique level of difficulty since hazards, such as bunkers and ponds, are all skillfully placed throughout the course. Hazardous sea winds provide players extra challenges. Players will also be able to enjoy the panoramic view of emerald green the South China Sea on some holes. The fourth hole is a beautiful over-a-pond par three. Players will need an accurate carry ball in order to surpass the water hazard. If the pin is positioned to the right side of the green, a bunker behind the green will come into play behind the green, too. A par five with a left dogleg bend. Off the tee, there is a long fairway bunker to the left and an OB zone to the right. The green extends to the oblique left. The three bunkers, guarding the green’s left side, enhance the strategic challenge on this hole. The best position to aim off the tee is towards the right half of the fairway. From there, it will be much easier for players to aim for the pin. The seventh hole is a long and downhill par three. Players will get themselves in trouble if their shot lands on the green’s front or right side bushes. The view seen from the green is magnificent. A wonderfully designed hole with a dogleg that bends to the left. The tee shot is downhill. In order to carry the bunker positioned at the left corner, a carry of 210-yard tee shot is required. The green is slightly elevated, and slopes from back to front. There is a bunker placed on the left side of the green will come into play on the approach shot. The eleventh hole consists of a light dogleg bend to the right. The approach shot is gently downhill. The green is horizontally long. Players should aim to hit longer than planned on their approaches as there is a large and deep green-side bunker placed in front of it. The difficulty level increases when the pin position is on the right, as the right side of the green faces a water hazard. A signature hole and a relatively straight and long par five that runs parallel to the coastline. The tee shot will require players to surpass the notorious Sandy Waste, a gigantic bunker that looks like a pond or a wasteland. In addition, players will face a narrow landing area from the tee and second shot, as the left side of the hole is engulfed by a wasteland and the right side with a forest. In order to score well, players will need to seriously consider the wind’s impact in order to achieve maximum accuracy. The green is elevated and guarded by a deep bunker to its front. Since the green is shallow and not deep, players should do their best to spin the ball well on the approach in order to prevent the ball from rolling beyond the green. A uniquely shaped par four that consists of a steep 90 degree bend to the left. Players should attempt their best to aim towards the left side of the fairway as it presents players with a shortcut to the hole. However, if the shot hooks, there is a chance that the ball can be caught either in a bunker or a hazard. The approach shot is slightly uphill over the large wetland area. Furthermore, there are bunkers that guard the green’s left and back sides, making this hole a quite challenging approach. The green is placed as if it is inside a jungle, giving players wild flavor. It is about a 30 minutes car ride from Brunei city and a 20-minute drive from the airport. 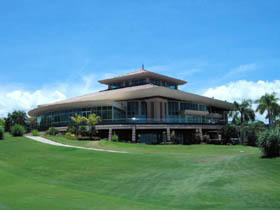 The golf course is adjacent to Empire Hotel, a luxurious 7-star hotel. Very tall marble pillars in the lobby are impressive. Players can make a reservation by contacting the golf course directly through a travel agency.The course is measured in a metric display and allows players to play from full back tee. The Jack Nicklaus designed courses in Malyasia, neighboring country of Brunei, are The Legends G&CC, Sungai Long G&CC and Borneo G&CC.